So here it is: The return of Captain America, in what may be the second most important comic in the Silver Age of Marvel (deferring only to Fantastic Four #1). After Namor fled the Avengers at the end of the last issue, he happens upon a group of Eskimos worshipping a frozen figure encased in a block of ice. Eager to lash out, Namor yells a lot and angrily throws the object of their attentions to the sea. Reaching warmer climes, the block of ice melts, and the figure is picked up by the Avengers in their ocean craft, homeward bound. 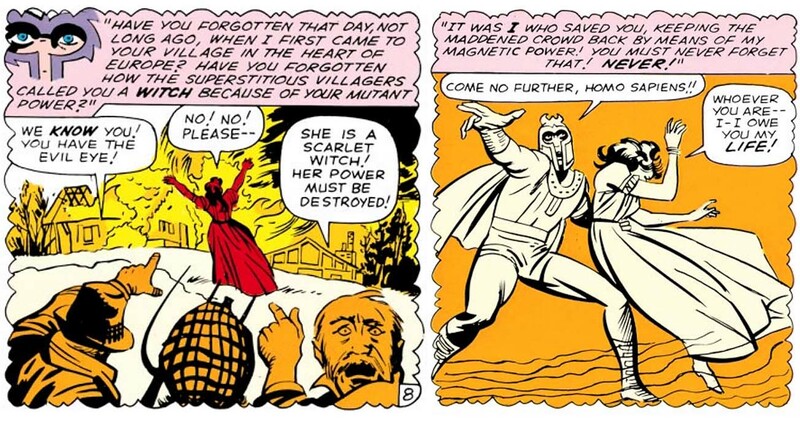 Witness one of the most famous moments in Marvel history. As alluded to in an opening caption, Captain America was first created and drawn by Jack Kirby (alongside Joe Simon) in 1941, and Stan Lee's first writing in a comic was a 2-page text story from Captain America Comics #3 - so, as they say, the circle is complete! Stan had teased Cap's return a few months back in Strange Tales #114, in which Torch baddie The Acrobat posed as a returned Captain America. At the end of the tale, Stan told the readership to let Marvel know if they wanted Cap back for real - and respond they did! Imagine how shocked he might feel had he returned today! Apart from the singular prospect of reviving a truly iconic character in a new age (something which had been attempted once before in 1953, but failed to take hold), why else might Stan have thought this a good idea? What else, he might have asked, could Cap have to offer the book? Well, although the Avengers were a great assemblage of many of Marvel's solo heroes, and they both worked and clashed in a way similar to the Fantastic Four, they didn't have any obvious leader like the FF did in the person of Reed Richards. But Captain America, by simple virtue of his legend and strength of character, would surely be looked up to by all, making him a natural choice. With this one change, the Avengers could change from a somewhat random collection of heroes into an inspiring and actual team. it's something Stan Lee grafted on specifically for his return. But Stan wasn't content to return the character unchanged. No, Stan had the genius to bring what could have been a stodgy, straightforward figure as a layered character in the new Marvel mold: complex and flawed. 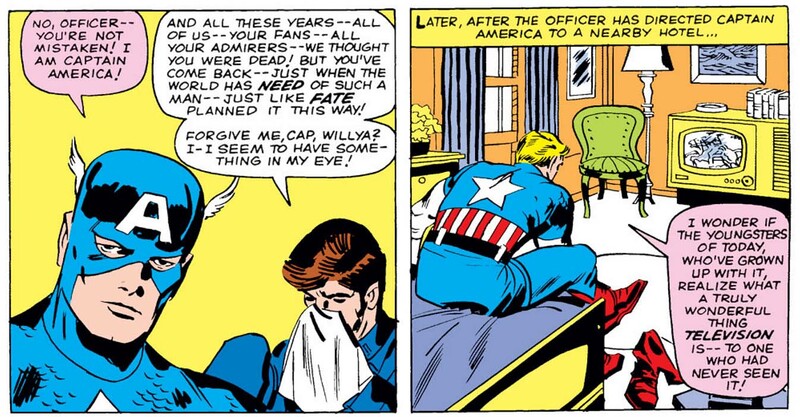 Specifically, by revealing that Cap had Rip Van Winkled his way from the end of World War II to the current day - two decades' worth - Stan could cast Steve Rogers as both a beloved war hero and a fish-out-of-water, lost and confused by the modern 1960s world he saw around him. And if that weren't enough, by deciding that Bucky had been killed during their last WWII adventure, Stan gifted Cap with a bit of pathos and tragedy to haunt him from the past. All this, and Rick Jones too! Stan certainly made sure you got your money's worth. Finally: The Brotherhood of Evil Mutants! Having gathered a few like-minded individuals, Magneto has assembled a true foil to the X-Men, and one of the major themes of the series can now be seen in this war of ideologies. The civil rights movement of the 1960s is an oft-cited point of comparison, with Professor Xavier - committed to the dream of racial integration - standing in for Martin Luther King, Jr., and Magneto representing the "by any means necessary" approach of Malcom X. Was the parallel an intentional metaphor, or accidental brilliance? Who can say? But it should be noted that MLK's famed "I Have a Dream" speech (audio here), its compelling rhetoric delivered on August 28, 1963, would have predated this issue by just a few months - and thus could very easily have been on the minds of Stan & Jack. You can just tell that half of their meals end in a food fight. What was Magneto doing in a rustic European village anyway? That may have been the first clue that later developments picked up on. We'll be seeing these mental battles much more in the future. But this is a pretty good early appearance! But the most important development, of course, is the introduction of the two reluctant members of Magneto's Brotherhood: Pietro and Wanda, otherwise known as Quicksilver and the Scarlet Witch. Wanda, as written here, is a bit too "damsel in distress"; her powers at this early stage simply create disasters, which she fearfully shrinks from. (She would develop into a much stronger character, though - and soon!) Pietro, on the other hand, is already massively arrogant and overly protective of his sister, yet with a trace of real nobility too. 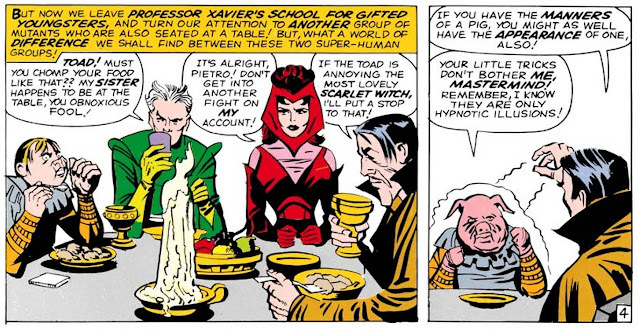 But what's not indicated - because, at the time, it wasn't intended - is the later revelation that Magneto is actually their father. The connection, heavily implied in 1979 (if not explicitly confirmed until 1983), was due in part to the physical similarities between father and son. 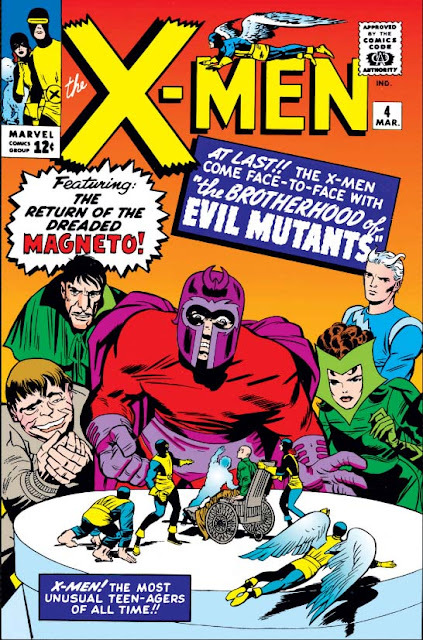 But note that we wouldn't see Magneto without his helmet until a Neal Adams-illustrated story in 1969, which means that Quicksilver was not accidentally drawn similarly to Magneto. Rather, Mags would eventually be drawn to look like Pietro! The threat this time out is the Infant Terrible (though this is just a name given it by the Four, as the alien creature never speaks). Reed explains to his teammates - and, by extension, the readers - that "The French have an expression called enfant terrible, Johnny! It means a child who does dreadful things!" The phrase's entry at dictionary.com expounds on this, stating that it also refers to "a person whose work, thought, or lifestyle is so unconventional or avant-garde as to appear revolutionary or shocking." (Which makes more sense as a term to have gained popular usage, rather than just another way of saying "naughty child".) See - comics can be educational! Amusingly, when the alien is next mentioned, in 1983's Official Handbook of the Marvel Universe, they needed a name to refer to the race - and, fittingly, chose "The Elan". I'm going to go out on a limb and guess that was a brainchild of the beloved and sadly-missed Mark Gruenwald, writer and super-editor extraordinaire; not only was he instrumental in the creation of the OHOTMU, but the joke fits his well-known clever wit. This early scene gives a good indication of the trippy developments to come. This is another tale of aliens coming to Earth, as with so many of this era - but unlike the bulk of them, it's not to spearhead an invading force. Instead, the title character is just a lost child who stumbles about causing surreal havoc in the course of amusing itself, such as the creation of a giant milk bottle floating in mid-air, an enormous spinning toy top, or robot soldiers which duplicate when hit (predating by a dozen years Madrox the Multiple Man). What's nice is that Stan and Jack don't try to keep this twist a surprise at the end, by which point the readership will have already figured it out; not only does the FF realize the alien creature's nature after their first encounter, but Stan and Jack feel no shame in telegraphing the story's unusual bent on the cover itself. Reed conjectures on the terrible consequences if the kid is not sent to his room. So if the twist of the alien being nothing more than an uncontrolled child is not the thrust of the story, then what is? Once again, it's Stan's innovation at asking himself how regular folk might react to news of the extraordinary. Specifically, as soon as the authorities broadcast Reed's theory of the alien as child - albeit one with ridiculously dangerous reality-altering abilities - a criminal boss gets it into his head to kidnap the creature and use him in their employ to break into armored trucks, turn small diamonds into gigantic ones, etc. Needless to say, it doesn't go as smoothly as they'd like. Reed, meanwhile, is concerned that at any moment the alien might turn his attention to the sun, with catastrophic consequences - but fortunately, his interstellar radio call to the child's parents pays off in time, as they swoop in at the last moment to reclaim their wayward tot. Coming soon to a theater near you: Mob Funnies! Although the story might not be the most thrilling adventure the FF have ever had, take another moment to marvel at the cover! The dramatic perspective gives the character a larger-than-life feel that fits his do-anything power, and the tableau of planets is a surprisingly effective invitation to a story of science fictional wonder. 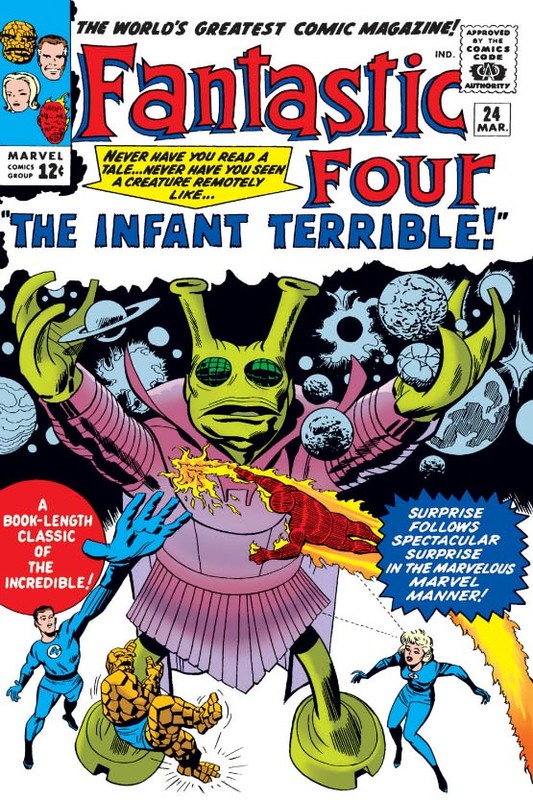 And if the story inside seems more a yarn of space wonder than we've seen in some time, there's good reason - for the fine folks at the Marvel Universe Appendix have pointed out that a similar story of a rampaging alien infant was first seen in Tales of Suspense, and another one just two years later in Amazing Adventures (the anthology comic that would eventually become Amazing Fantasy). As we've seen before, Stan never let a good idea go unrecycled! Aw, man! So much trouble that Mom and Dad had to come pick him up? I think it's safe to say that kid is totally grounded! 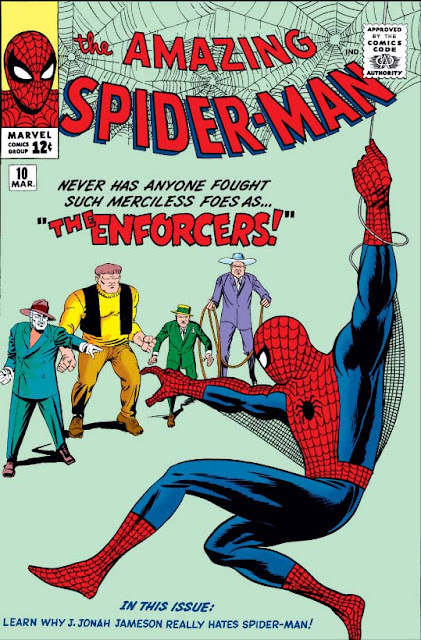 This issue sees Spidey face off against the mysterious Big Man. Though he might sound like a new villain for Giant Man, it's actually the intimidating name of a crime boss intent on bringing all the other New York mobsters under his control. His features hidden under a dapper suit and frightful mask, he exerts pressure via his three Enforcers who, though gimmicky (brute strength; quick reflexes & judo; mastery with a lasso), have no real superpowers. Though conceptually similar to Doctor Doom's recently-employed Terrible Trio, these baddies - and the Big Man himself - are simply gangsters; nothing more. In this way, the comic hearkens back to the Golden Age comics of the '30s and '40s, when powerful heroes like Superman and the Human Torch fought mob bosses, racketeers and other realistic villains far more often than fantastical, super-powered threats. But if it sounds like a bunch of regular guys are too slight a threat for a hero who has faced the likes of The Sandman and Doctor Octopus, worry not. Following Aunt May's operation last issue, her doctor tells Peter that she requires a blood transfusion to recover. He initially panics at the thought that a diagnosis of his blood might reveal his super powers, but forces himself to quell his fears and hope for the best. He's relieved to find that the tests reveal none of his secrets ... but having lost a good amount of his super-powered blood, he's thus left in a significantly weakened state which lasts for several days. That, of course, is when the Big Man strikes...! Meanwhile, Betty Brant's secret continues. Having hinted last issue at a dark something in her past, Peter now comes across one of the Big Man's mobsters pressuring Betty for money. At some point she had borrowed from a loan shark - for reasons she refuses to disclose - and when Peter begs her to confide in him, she tearfully flees town, leaving not just Peter but her job at the Daily Bugle as well. Parker is left dazed, wondering what secrets she could be hiding to push her to such a state. He - and we - will have to wait till next issue to find out! Finally, the cover proclaims that this issue we "learn why J. Jonah Jameson really hates Spider-Man!" ("Secrets" really does seem to be the theme this time, doesn't it?) And y'know what? Not only is this not a case of false hyperbole, it turns out to be an answer so rich, and so fitting, that Jonah's revealing soliloquy - though only three panels long - has become one of the most famous scenes in Spider-Man history. One thing you've got to give Stan credit for is that he may not always remember to give his antagonists sufficient motivation - but when he does, it really resonates. Hey, check it out - the Porcupine's back! And I'm pleased to say that his weapons are even more ridiculous than before. You may recall that his gimmick is a suit designed to shoot out a number of special quills - including sleeping gas quills, a suction cup quill, a radar quill, a concussion ray quill, and a quill that shoots a flypaper pellet. (Seriously: a concussion ray quill? That doesn't even make sense!) 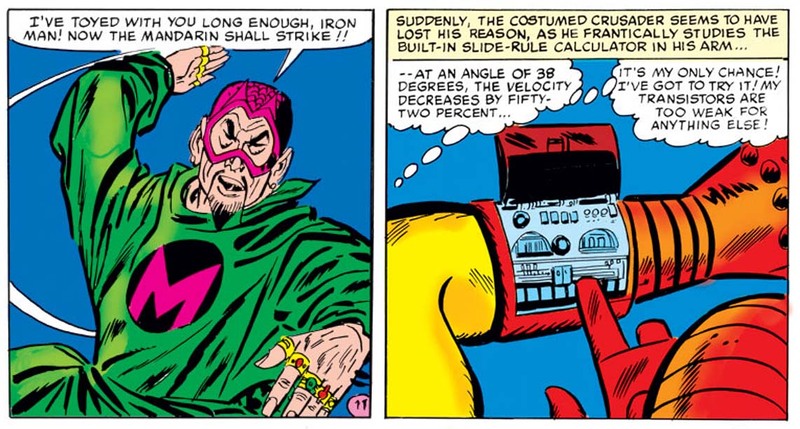 Oddly enough, this "many gimmicks in one" trick seems to be a developing obsession of Stan's; in addition to the Imps from Pandora's Box, we were recently introduced to the Mandarin and his ten rings of power, even if their different uses have yet to be fully detailed. And we've not even seen Marvel's most famous example, Hawkeye the Marksman and his trick arrows - though that's not too far away! Porky acting as a poor man's Spider-Man. A very, very poor man's, indeed! 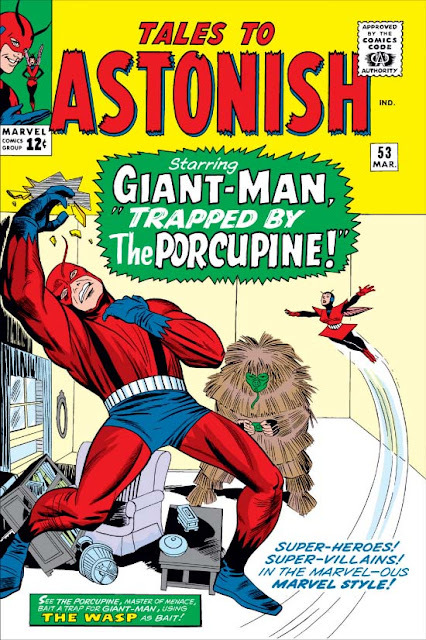 Sadly, the Porcupine is not one of Stan's more complex villains, as his reason for targeting Pym in this story is nothing more than revenge for his previous defeat. 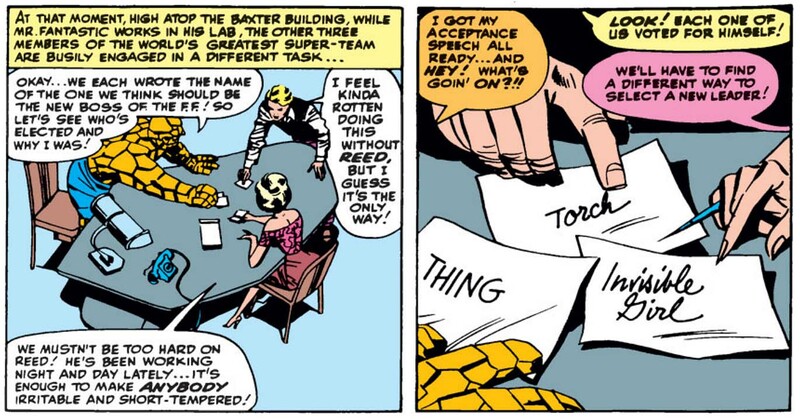 But what he lacks in motivation he makes up for in ingenuity, as he quickly decides that the best way to sidle up to the hero is by infiltrating a Giant-Man & The Wasp fan club! (Recall that we'd already seen an example of superhero fandom two issues back.) So he shows up at the door of the local chapter, where the kids are surprised by his age - and kudos to Stan for realizing how odd such a thing would be! - and convinces the members that they should all dress up in costume as Giant-Man's various enemies, and then meet him. Thus providing himself plausible cover. It's a wonderfully inventive plot point, and makes the adventure incredibly entertaining. The Human Turnip? It's nice to know Stan & co. have no problem poking fun at their own work! The climax of the story comes about when the Porcupine - having incapacited Janet via the aforementioned flypaper - grapples with Giant-Man at close quarters, and deftly nabs Pym's growth pills. He at once pops several of them down his throat, reasoning that if one pill was enough to make Pym a Giant-Man, then many will make the Porcupine unstoppable! 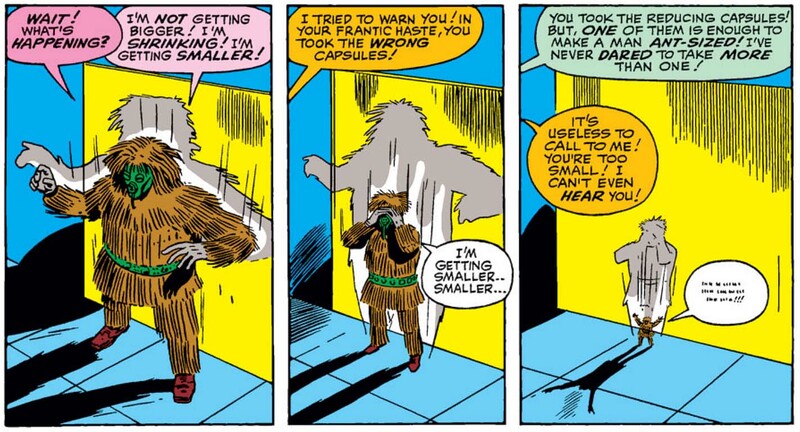 But, to his horror, Pym informs the villain that he'd actually grabbed the shrinking pills, and the Porcupine rapidly and inevitably shrinks out of sight. However, Stan's closing caption reads: "But those of you who are familiar with such things have a suspicion that somehow, in some way, the Porcupine may someday return ... more dangerous than ever! And, y'know something? You may be right!" 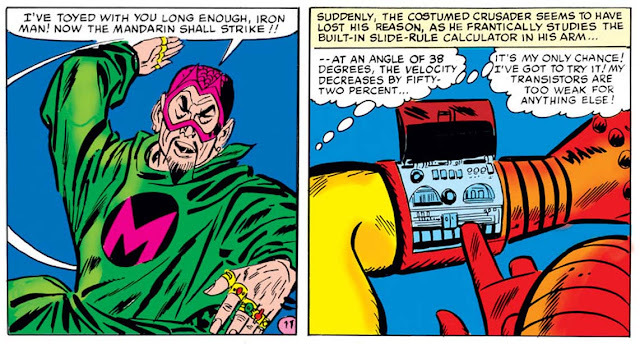 It's almost as if during the writing he remembered that he'd once had Doctor Doom shrunk to nothingness, and had thus been forced to come up with a rather ingenious solution (in a story that coincidentally guest-starred Ant-Man). Would the readers remember as well...? I wonder how many kids pulled out a magnifying glass to see if they could read his last line! Meanwhile, the Wasp's backup story this issue is "When Wakes the Colossus! ", a sci-fi parable about an alien warlord who constructs a giant stone statue, via which he keeps control over the superstitious people he's conquered. (Essentially, it's a giant scarecrow, with the people as crows.) While the 5-page story is unusually engaging, and with a fairly surprising twist, it does show another odd penchant of Stan's: that of reusing character names. And I'm not referring to the future steel-skinned member of the X-Men; he wouldn't be introduced until 1975. Rather, I'm pointing out that the Giant-Man story to be seen in a not-too-distant issue #58, only five months away, will be titled "The Coming of the Colossus". And a stone giant by the same name had also appeared back in 1961; originally just the antagonist in a one-shot monster yarn, it would be brought back a dozen years later by writer Tony Isabella to headline a feature of its own as the richly-titled It! The Living Colossus. You've got to admit - that's a pretty striking image! When our story begins, we find Thor doing his best impression of The Hulk. In a foul mood, he stomps through the city - heedless of the destruction left in his wake - and snarling that he just wants to be left alone. 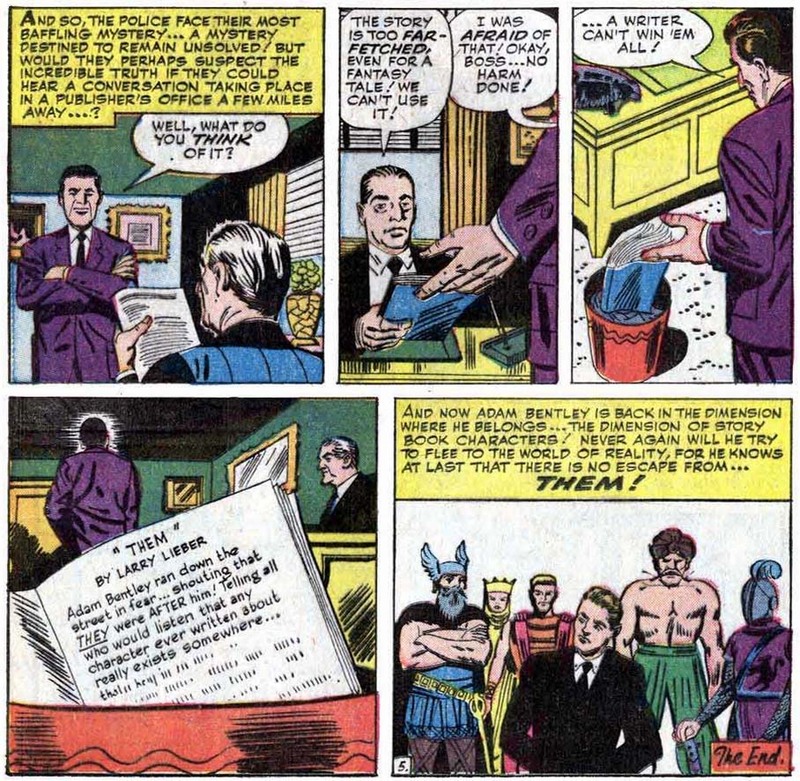 Regular folk flee from his temper tantrum; instead, his teammates Iron Man, Giant Man, and the Wasp are alerted to the predicament by Pym's army of ever-vigilant ants. 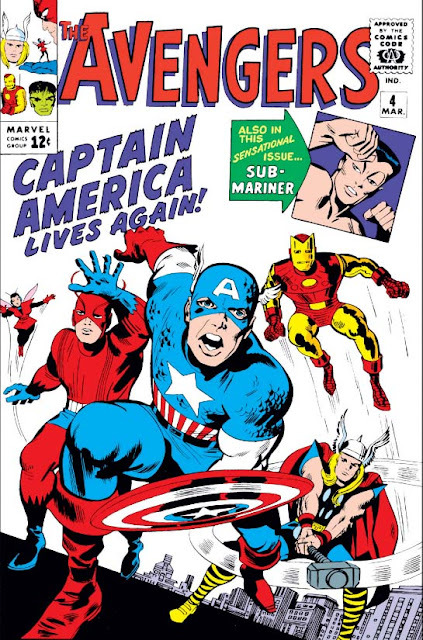 The heroes aren't mentioned as such - in fact, the name "Avengers" is never used - but perhaps Stan felt safe in assuming that even if Thor's readers weren't also picking up The Avengers (of which only three bimonthly issues had yet appeared), they would at least be aware of Marvel's ever-growing superhero presence on the racks. Once Thor starts acting like an adult, maybe Odin will treat him like an adult! And what is Thor so angry about? Jane, of course. Specifically, Odin's refusal to let Thor marry her, convinced as he is (via grave misunderstanding) that she's simply not worthy of the love of a god. In fact, Odin is so incensed at Thor's adamant devotion - defying the wishes of his father, the All-Father - that, at Loki's whispered urgings, he strips Thor of fully half his power and might. At this, Thor finally stops to reflect (and mope), musing dejectedly on his heartbreaking dilemma. Perhaps Loki just wants a spiffy, shiny jetpack? Maybe? No? 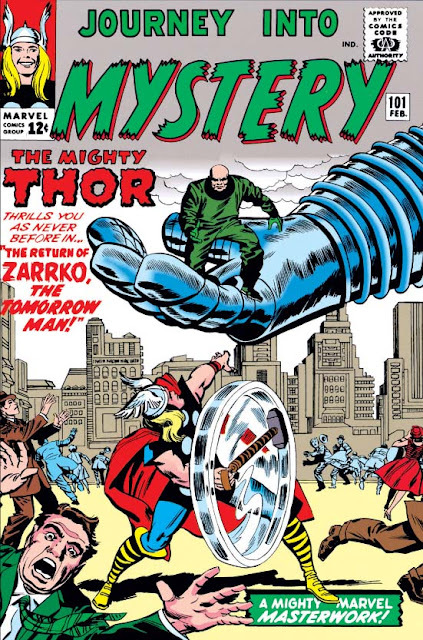 So of course it's when Thor is at his weakest that he's faced with the return of Zarrko, The Tomorrow Man, one of his very earliest enemies. (And what a striking cover to herald his return!) At the end of their first encounter Zarrko had lost his memory, but Loki magicks it back to take advantage of Thor's weakness. Despite the grandiose name, The Tomorrow Man is little more than an overly ambitious scientist guy from the future ... yet with the help of a giant robot he's able to bring down the lessened god, easily, and then blackmail Thor into returning to the 23rd century alongside him, there to execute his plans of conquest. The last thing we see is the two of them fading from the present, on their way to the future; how will Thor be able to fight back? Thor alone, against the many invaders of Asgard. 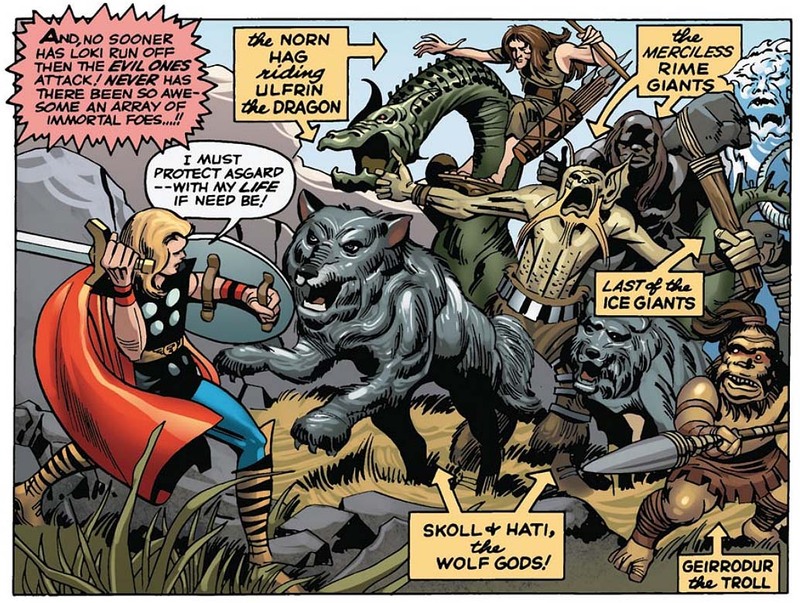 Meanwhile, back in the present, March 2, 2011 saw the softcover collection of Tales of Asgard, a 300-page reprinting of all the Stan & Jack ToA backup stories. Though it's not the first time these stories have been collected, it is the first time they've been reprinted in their entirety, and on their own. Even more interesting is that for this reprint Marvel opted to try an experiment they've attempted a couple of times these past few years, though never so completely: that of recoloring the pages from scratch, using the limitless possibilities afforded by today's technology. To say that this is a divisive issue would be an understatement, as there are those who feel that such a change places the final product at too great a remove from its original form. (Then again, I've also heard the same said about the stellar remastering found in Marvel Masterworks, so it's certainly an argument of degrees.) Myself? I actually like this new coloring a lot! Yes, it's different from the original publication - but let's recall that what saw print was often represented by muddy or mis-aligned colors (due to poor printing technologies), in remarkably few hues (due to the limitations of the colors available), and often unfairly soaked up by the thin newsprint. Were today's technologies available back then, I do think Stan and Jack would have wanted art closer to what's seen in this new collection - and I do think the modern coloring gives Kirby's art an added dimension, beyond that which we already praise. 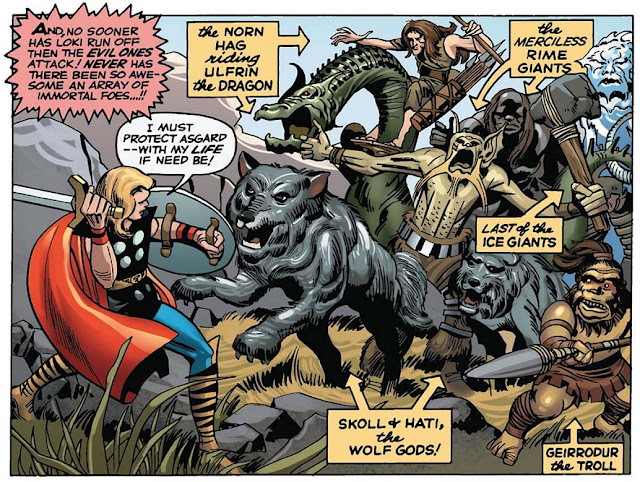 A three-panel sequence showing the comic as originally appeared; the remastered version published in Marvel Masterworks; and the recolored edition for the new Tales of Asgard collection. Introducing: The Mandarin! Yes, after enduring such throwaway baddies as The Red Barbarian, the Mad Pharaoh, and Mister Doll, we finally get Iron Man's Doctor Doom. Sadly, he's always been a problematic character as well. A "Yellow Peril" figure from Red China, he's a stereotype through and through: From the "Chinese mystic" caricature displayed on the cover, to the pointed beard and Fu Manchu mustache - itself named after the more famous stereotype who wore it - the racist overtones of these early appearances have dogged the character ever since, preventing his appearance in the Iron Man films of the last few years, and even prompting Tony Stark's current writer, Matt Fraction, to address these elements in interview before bringing the character back (in what proved to be a satisfyingly complex tale of terror). 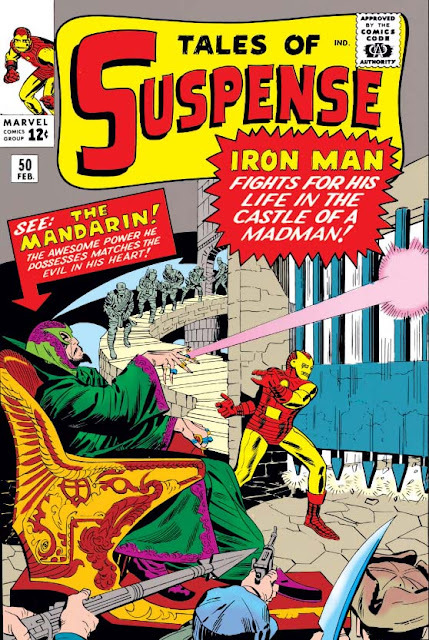 Although it should be said there is something appropriate about Iron Man's archenemy being a product of the politics of the time, given that Iron Man himself came out of the Vietnam War. That thing you just heard? That was the sound of my jaw hitting the floor. So, it's issue #50! How, we wonder, will Marvel celebrate this milestone achievement for the title? Well, by ... dropping Iron Man's story count from 18 pages back to 13 (as mentioned above), for the first time since issue #46. (Why?) In its place is an unrelated 5-page backup story, "Them! ", of the sort that Tales to Astonish, along with the rest of Marvel's anthology books, looked to have been getting away from. Strange, that. But we'll let it go, because "Them! ", a story in which a terrified man is fleeing from storybook characters come to life (which only he can see) has the funniest twist of all - when it turns out that he, too, was nothing but a fictional character! A character created by ... Larry Lieber. depiction of both himself and publisher Martin Goodman. Meanwhile, the latest installment of "Tales of the Watcher" gives us "Journey's End! ", a story about meek and timid Wilbur Weems, a space pilot in the far-off 21st century. Picked on and laughed at by his unwaveringly gorgeous peers in this futuristic society, he nevertheless volunteers for a dangerous, one-way mission that no one else will consider. 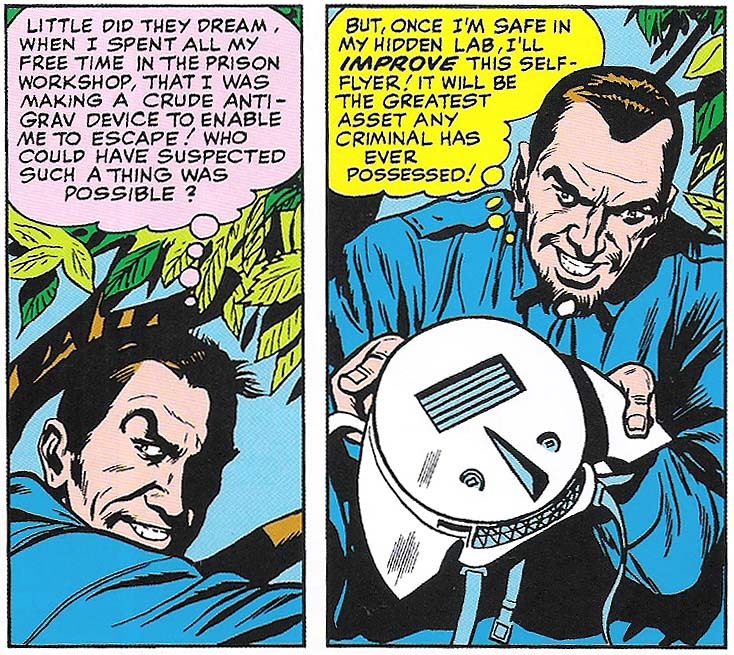 The predictable twist, of course, is that instead of doom he receives great rewards, as the threat he was sent to investigate turns out to have been a test designed to attract the most brave. Though just a 5-page story, it's effectively pleasing to see the character make his resolute decision simply because it's the right thing to do. On the one hand, yes, it is simplistic (and we can debate whether or not the ending reward undermines the idea that hard decisions should be made on their own merits, and not for what we think we can gain), but it's worth remembering that these were stories written for kids, and read by kids, and the unfettered delivery of ideas like selflessness and self-sacrifice were - and still are - ones worth introducing. Oh yeah, and the dust cloud also transformed him from a nerdy shlub into a muscled hunk. A bit too much wish-fulfillment there? Right off the bat, we can see we've got another story starring the FF's main baddie, Doctor Doom. Okay, cool; we like him. But the cover doesn't sell much beyond that, and it's a point worth thinking on. Back in the day, when comic books were largely an impulse buy, the cover was considered the most immediate and striking tool in making that sale. (See, for instance, DC editor Julius Schwartz's thoughts on the matter.) At a glance, a kid perusing this on the rack might wonder, "What's different about this comic? How does this story differ from other Doom stories we've seen so far?" And, going from the cover, we just don't know. debuted just last month, and the story opens with her saving the day yet again! Something else that's slightly inexplicable is the reintroduction of Doom's time machine, first seen in Doom's debut tale back in FF #5 - odd, because it doesn't actually figure in to the story in any meaningful way. I mean, it's cool, but after those first few pages, we're left wondering: Why? It's tempting to conjecture if they were actually setting the stage for a future story that would make use of the time platform, but that seems unlikely; not only does this go against the improvised, make-it-up-as-they-go feel that's characteristic of this early time of Marvel, but we also see that it only takes a few lines to mention the time machine and where it came from. So who knows - maybe Stan and Jack just wanted to open with a crazed dinosaur run amok! A what now?! Okay, this master trap isn't just nonsensical - it's trippy! Could the bizarre worlds of Dr. Strange be an influence here? This time, however, Doom's not attacking on his own. Instead, he bails out a trio of baddies and then uses his technology to amplify their natural traits, so that the suave con man has preternatural hearing (perfect for detecting someone who's invisible), the circus performer who's resistant to heat is made completely fireproof, and the strong man of the group has his physical power increased a dozenfold. 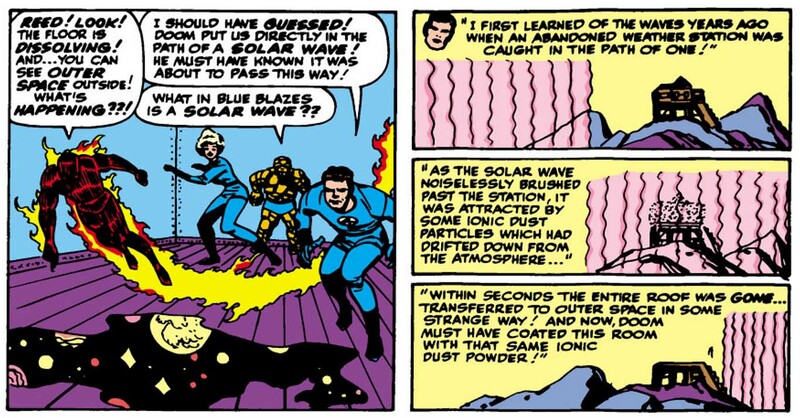 Thus creating a foil for the Thing, the Torch and the Invisible Girl, this leaves Reed Richards for Doom himself - and we thus have, for the first time, a dark mirror to the Fantastic Four (though one that never again functions as a foursome, and will be forgotten the following year in favor of the FF's more famous villainous quartet). 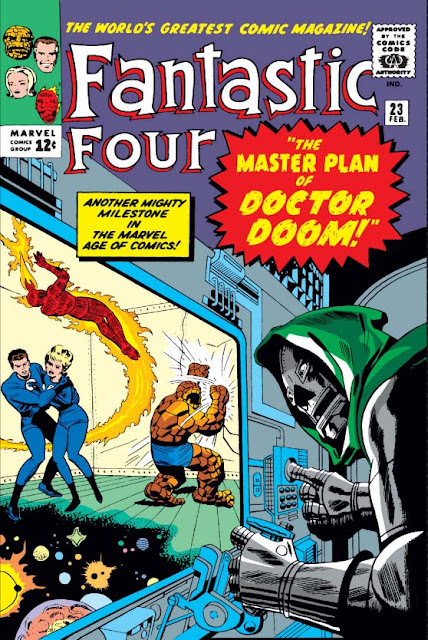 Of course, as soon as they've taken down the Four, Doom immediately betrays the others - which is dumb and premature, because when the FF escape, he's outnumbered four once again. You might think he'd avoid turning on his cohorts, after doing so to the Sub-Mariner in their first team-up scotched his plans. Then again, why should he have learned from his mistakes? Subby certainly didn't! Even when they try to work out their differences, it ends up being a laugh! Over the course of this tale, Reed is once again being an arrogant clod, barking orders and dismissing his friends. While you can understand why Stan might have leaned in this direction for easy conflict - and it's worth remembering that over at DC the heroes hardly bickered at all - it is beginning to feel as if we've seen Mr. Fantastic (and note the arrogance in the name alone!) offending his friends and teammates with his attitudes more often than offering warmth and support. Fed up, the other members consider that they're tired of Reed's position as leader of the group, and maybe it's time for someone else to take the reins. But then they all bicker about who it should be! gives a good idea of what was going on at the time. 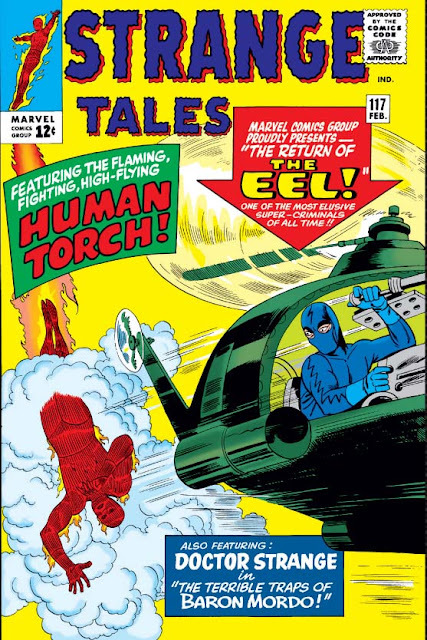 With this issue, we're now halfway through the Human Torch's run in Strange Tales, which seems rather astonishing: that, for the length it's already lasted, we still have again as much until it's done. As if that's not enough, the same can be said for Hank Pym, whose (Gi)Ant Man feature has only reached its own halfway mark in Tales to Astonish. When reading these stories alongside the other Marvel superheroes of the time, it seems clear that these strips weren't working, and the characters maybe just don't have enough complexity to really shine as solo stars. 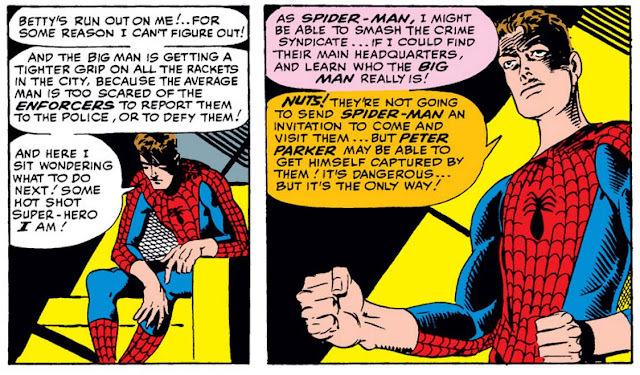 They certainly don't seem to generate the same amount of excitement and inspiration in its creators as, for instance, we see in The Fantastic Four or The Amazing Spider-Man - but Stan seems committed to them, and won't see fit to oust Pym and the Torch from their respective mags until the summer of '65. But at least, with Stan so fully committed, they seem to be making better use of the FF in these stories. The early days of the Torch's solo adventures, which kept Johnny relegated to Glenville and seemed to only grudgingly acknowledge his life as part of the FF, are thankfully behind us. Instead, Reed and Sue appear in the background of the story naturally, as Johnny's supporting cast, in much the same way that Aunt May does in Spider-Man. They offer advice, ideas and support, neither treating Johnny as if he's the only one who can combat a threat nor belittling his importance. In fact, for the first time the relationship between this strip and its parent title seems to have found its stable footing. Will that newfound approach last...? This ... this is just fantastic. I've no words, really. As the story opens, Johnny hears that The Eel (whom he fought not long ago) is on the loose again, so off he flies to nab him. 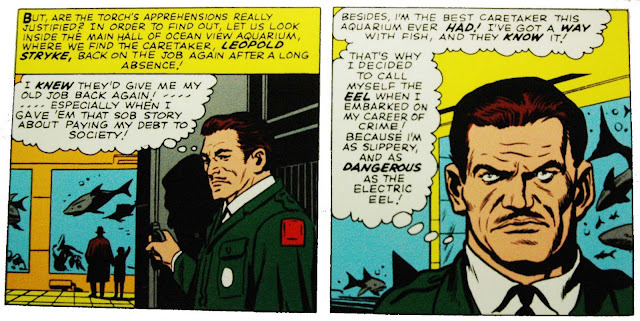 However, as soon as Johnny apprehends him on the edge of the prison environs, he's admonished by the Eel, the guards and prison warden alike. It turns out that the Eel has served his sentence, and is out early on good behavior! 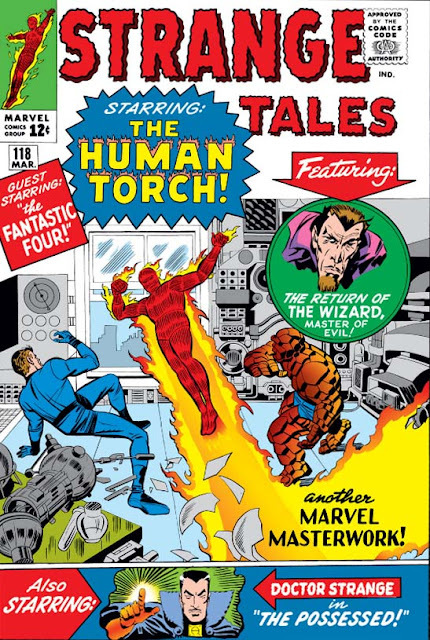 In fact, he calls the Human Torch himself a menace, and threatens to sue Johnny for assault and battery. The Torch, bewildered, finds himself at a loss: He knows the Eel must be up to no good, but until an actual crime is committed, he can't prove a thing! This self-aware commentary on the vigilantism of the superhero is only hinted at in these pages, but it's nice to know that such musings are at least tangentially on Stan's mind. In reality, the old building's just nipped out for a drink. Don't wait up. Yes, "it is written". So there it is then!